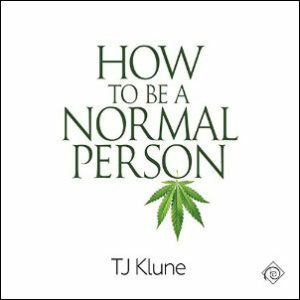 I can’t believe I waited as long as I did to read How To Be A Normal Person by TJ Klune. It’s one of the sweetest romances ever and with the voice performance of Derrick McClain the book is pretty much perfect. Gustavo Tiberius thinks he’s not normal. “Normal,” of course, is relative. From the get-go I found him quirky. He lives a fairly closed-off existence in a small town Oregon. To hear him tell it, he’s also been different but since his father died a few years ago, Gus tends to keep the world at bay. When Casey Richards shows up in town and starts working at Gus’ coffee shop, Lottie’s Lattes, everything turns upside down. Casey is an asexual stoner hipster and he thinks Gus is the best thing ever–worthy of taking selfies with and worthy of bestowing hugs on. I love how Klune unravels Gus’ world and puts it back together again. The frantic calls to the cable company to get the internet hooked up so he can research how to be a normal person since that’s not covered in the encyclopedias he owns. The conversations with himself as he tries to implement what he’s learning from the internet. And then there’s Casey, who is one sweet guy. He’s upfront with Casey that he’s asexual and what that means and, while he doesn’t try to outright change Gus, he does help Gus open up to things like epic hugs. It’s great how these two come together and become the things each other needs. There are some great supporting characters in here too–Lottie and the elderly, Vespa riding We Three Queens are awesome. Even before Casey shows up they are trying to get Gus out of his shell. The cable company operators are a hoot, and the other glimpses we get of the citizens of Abby, Oregon are awesome (and sometimes disturbing) too. I’m so glad I went with audio to “read” this book. McClain nails the performance. I don’t think the voices in my head would’ve been anywhere near as perfect as what McClain did with Gus and Casey. I don’t think I’ll ever hear “Oh my God!” or “What the hell?” the same way again. McClain is also pitch perfect with Gus’ anxiety, always finding exactly the right vocals for the moment. Pick up this book (and preferably audiobook) if you want a super sweet romance peppered with some good laughs and goosebumps.